Reported by the Knysna Plett Herold – The Featherbed Co., operators of the Paddle Cruiser, regrets to confirm the partial capsize of the boat at the company’s ferry terminus on Remembrance Drive. The port (left) side of the vessel is lying under water, and is resting on the Estuary floor. The accident happened during the early hours of this morning. No one was on board at the time, and nobody sustained any injuries. “The accident happened during the early hours of this morning. No one was on board at the time, and nobody sustained any injuries. 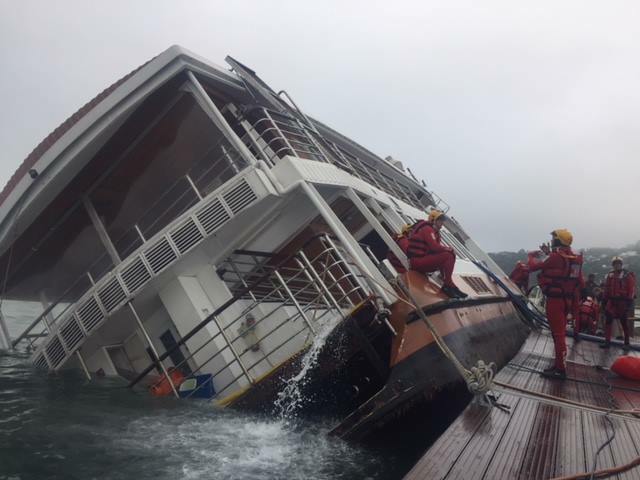 “The cause of the accident will probably only be ascertained when the vessel has been righted. “Management and members of the company’s staff were in attendance by 7:00 a.m., with volunteer crew of NSRI Station 12, Knysna, arriving to assist with stabilisation shortly after. Officials and rescue services from the Knysna Municipality, and representatives of SANParks, which manages the Estuary, are also currently in attendance. “Personnel on the scene are taking steps to prevent further damage to the vessel, and to prevent any pollution of the estuary. “The company will continue normal services – eco-tours of the Featherbed Nature Reserve, and boat trips on the John Benn, Heads Explorer, Three Legs, and Knysna Rib Adventures – as normal from 10:00 a.m. today. Previous Post Lewensbootjie – Selfbeskikking.